What is a Rough Puff Pastry? Rough puff pastry does not rise as high as classic puff pastry, so it is not suitable for products where a light texture is desired. It is mostly used with layered cream fillings and meat dishes such as napoleons and beef wellington, respectively. How is rough puff pastry made? Traditional puff pastry requires a block of butter to be sandwiched between two layers of dough and is then sheeted out multiple times and folded over itself to create alternating layers of dough separated by layers of fat. While this results in a very light and delicate product, it is often time-consuming and labor-intensive. Rough puff pastry is prepared by incorporating butter or fat in the form of golf-ball size chunks into the dough, instead of the entire slabs used in classic puff pastry. This is followed by sheeting and folding with minimum or no resting time between successive folds. The result is a laminated puff pastry dough with discontinuous fat layers which bakes up into a crisp and flaky pastry structure. Addition of small amounts of lemon juice into the formula ensures dough tenderness during processing and baking. *Butter for dough is a percent of the total flour weight. Mixing. Dry ingredients and butter (cubes) on low speed to maintain the butter pieces intact. Add liquids and mix until a rough dough is formed. Allowing the dough to rest for about 20 minutes. Sheeting the dough to the desired thickness. Once the desired number of layers is achieved, the dough is then sheeted down to around 0.6-0.8 inches and packaged. Rough puff pastry is essentially a non-uniform and inconsistent dough with fewer folds than classic puff pastry. Similar to classic puff pastry, the rough puff version can be prepared fresh or obtained as a ready-made chilled or frozen mass. 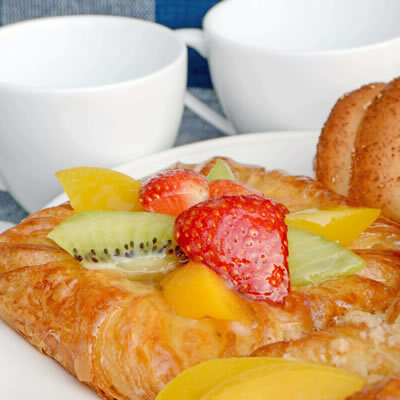 Commercially, large-scale rough puff pastry manufacture can be made in batches or using continuous production lines for their use at home or restaurants and food service establishments. Maintaining dough extensibility during lamination. This is done by staging two automated reduction (sheeting) and laminating lines set at 90° angle from each other to equalize directional stress in the dough. Ensuring the building of alternating layers of dough and fat during lamination. Maintaining the laminated structure during baking to entrap steam and therefore provide the lift required for the development of the crisp and light texture. Avoiding over mixing during lamination and breaking down the butter into chunks, risking their complete incorporation into the water-based dough. Similarly, undermixed dough will not have enough strength to hold the butter chunks or may cause large butter pockets between dough pieces. A low ambient temperature (10–20°C) must be maintained in the plant to prevent the fat from melting or from being too hard to mix and sheet. Suas, M. “Viennoiserie” Advanced Bread and Pastry: A Professional Approach, first printing, Delmar, Cengage Learning, 2009, pp. 476-505. Jones, B., and Robuchon, J.. “Puff Pastry.” New Concise Larousse Gastronomique: the Culinary Classic, Revised and Updated Edition, Hamlyn, 2007, pp. 937. Jones, Bridget, and Robuchon Joël. “Puff Pastry.” New Concise Larousse Gastronomique: the Culinary Classic Revised and Updated, Hamlyn, 2007, pp. 938.